When the cupboards start to get a little too full I like to do what I call “Spring Eating”. That’s when I take everything I can possibly fit into a bowl, mix it up, call it a recipe, and EAT it. That’s exactly what happened with this EVERYTHING Granola. And it was magical. By the way, what the heck did we put stuff in before Mason Jars became popular? I cant remember my life before the Mason Jar, and I dont want to. So a big Thank you to all the Hipsterific folks out there! 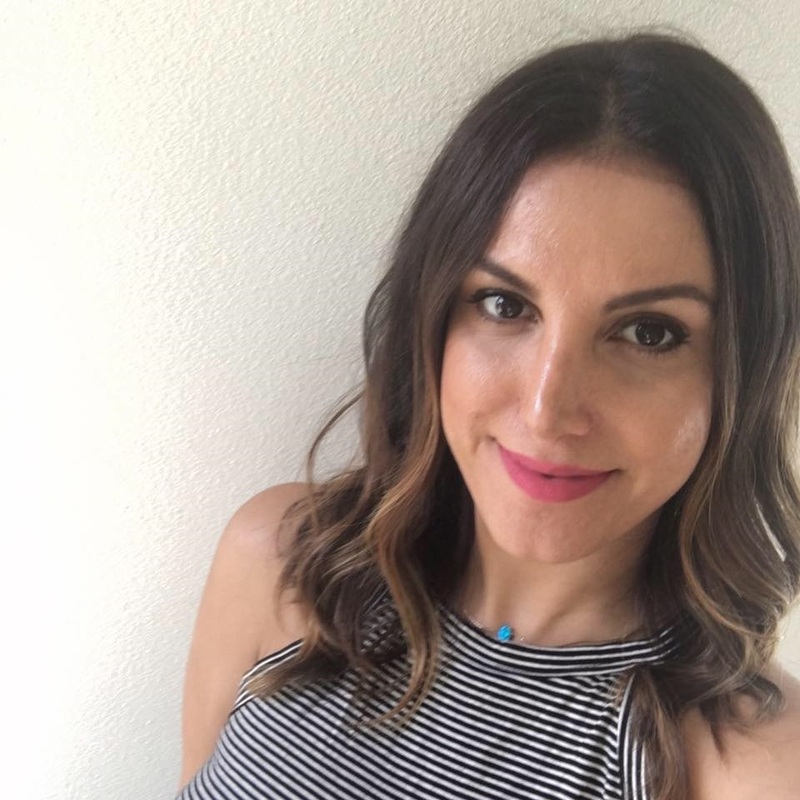 First, I’ll give you the complicated (not) and time consuming (mostly just watching the refrigerator) recipe to my Chocolate Chia Seed Pudding! Pour everything in a mason jar, mix well, close mason jar, place in fridge, wait for 24 hours, and voila! 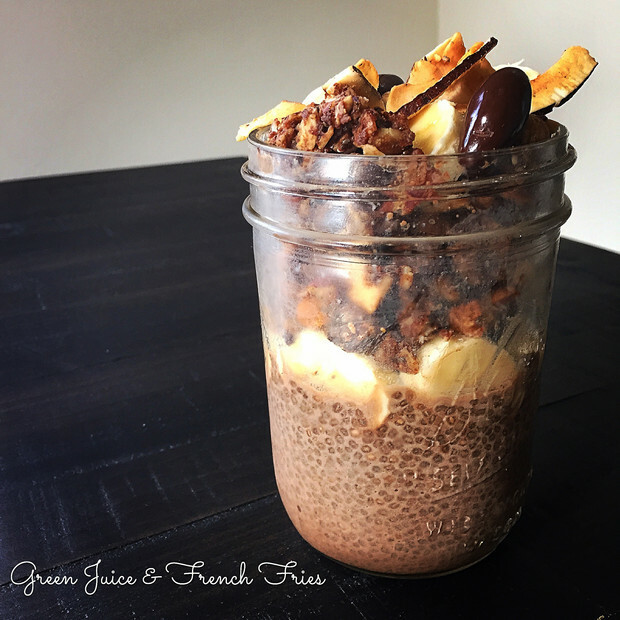 CHOCOLATE CHIA SEED PUDDING! Now that you know the secret, you can mix the variations up and create all kinds of pudding, yogurt, etc… Chia Seeds are Magic! 1. Mix all your wet ingredients really well in a blender or food processor and get it all incorporated into a delicious chocolaty colored sauce. 2. 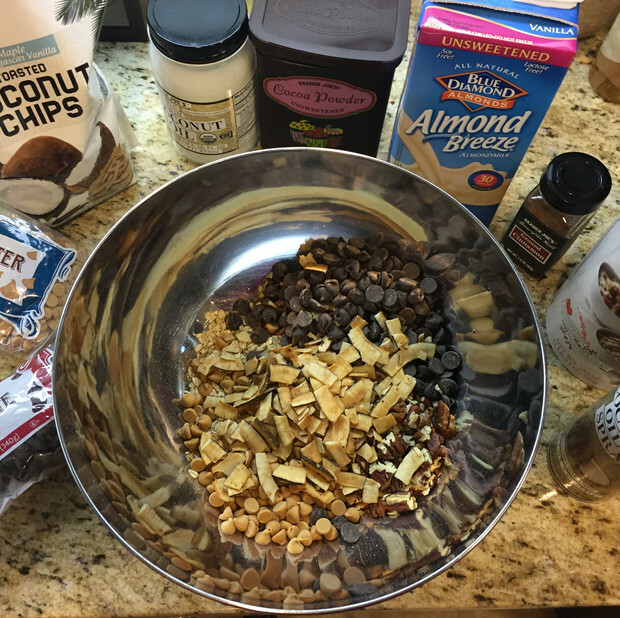 Mix all your dry ingredients in a big bowl. 3. Combine your wet ingredients with your dry ingredients and mix well some more. 4. Spray a baking sheet with coconut oil spray very generously. 5. Transfer your EVERYTHING mixture to the baking sheet and spread evenly. Packing it tightly so everything in the baking sheet is hugging each other. 6. Place baking sheet in a 375 degree oven for 15 – 20 minutes. Removing once midway to give everything a nice stir. You want this to get toasty on all sides. 7. Remove from oven and let cool completely. Ok fine, go ahead and taste it. So gooey and delicious right? Ok, now let it cool completely. 8. 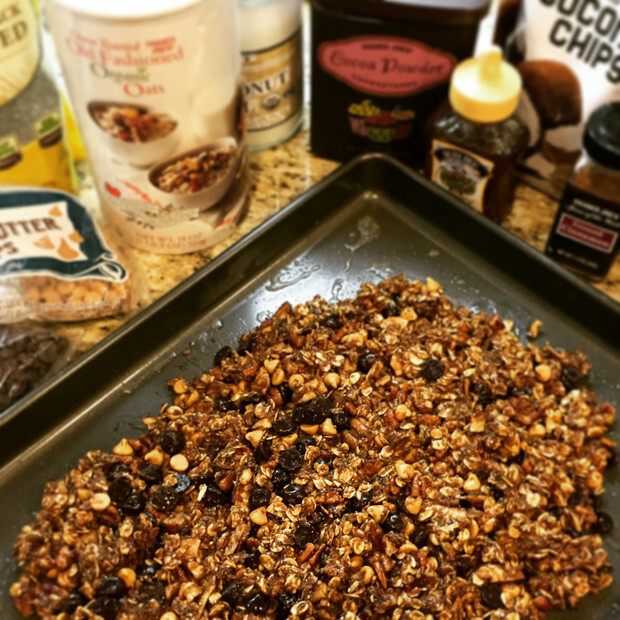 Throw your everything granola on top of your chocolate chia seed pudding, grab a BIG spoon and enjoy this sweet, energy blasting, happiness giving, VEGAN treat! note: the Chia Seed pudding recipe serves 1 and the Everything Granola serves about 4 – 6, or just 1 depending on how much of a sweet tooth you have.